Though Lewis’ preaching would grow more sophisticated — he is a graduate of both Fisk University and American Baptist Theological Seminary in Nashville — he ultimately would make his mark as a man of action; the movement had its man of words in Lewis’ idol, the Rev. Martin Luther King Jr. The evening began with a welcome from Emory Law Dean Robert A. Schapiro, who honored Lewis as a man “who has committed his life to the highest ideals of social justice and public service.” Alluding to Lewis’ 2014 honorary doctor of laws degree from Emory, Schapiro proudly claimed him as an “Emory lawyer” — one of countless honors bestowed on Lewis, including the Presidential Medal of Freedom, awarded by President Obama in 2010. 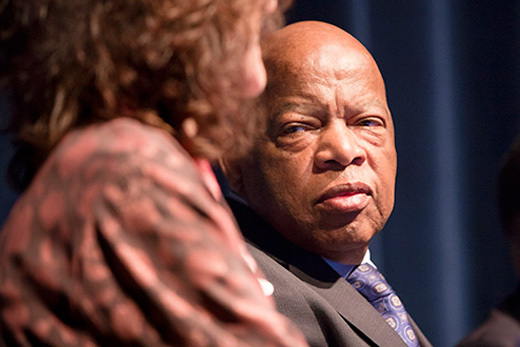 A year ago the law school’s relationship with Lewis further deepened when an anonymous donor gave $1.5 million to establish the John Lewis Chair in Civil Rights and Social Justice. The chair will be awarded to a distinguished scholar with a demonstrated commitment to upholding the rule of law through the study of civil rights. Before the screening got underway, Hank Klibanoff —James M. Cox Jr. Professor of Journalism — moderated a panel discussion that included the filmmaker, Kathleen Dowdey; Lewis; and Charles Floyd Johnson, executive producer of the documentary. The premiere took place last year at Washington University in St. Louis, where Johnson described “everyone craning their necks to gauge the reaction of Congressman Lewis.” They needn’t have worried. Lewis describes being very moved by the results, especially by the comments of the colleagues in the film who fought with him on the front lines. The film takes its title from Lewis’ penchant, as his mother ruefully described it, for “getting in the way.” For a young man of Lewis’ background and skin color — growing up one of 10 children of sharecroppers before desegregation — the risks of challenging the existing system were many: beatings, arrests, even death, along with the fear that the family farm would be bombed or set on fire. Lewis could see results beginning to shine through, as King later would say, “the long night of captivity.” Indeed, the Montgomery bus boycott that Parks sparked mobilized everyday people. In the end, it lasted 381 days, and 50,000 people demonstrated the power of their purse by walking everywhere they went, hardly minding the rain or snow. At the age of 17, Lewis wrote to King. Soon thereafter, he headed to Fisk and began studying nonviolence with the Rev. James Lawson. One of Lewis’ professors had been with King at Morehouse and arranged for them to meet in Montgomery. "Get in the Way" deliberately highlights chapters of Lewis’ life where profound personal change occurred. For instance, unbeknownst to his family, Lewis became a leading figure in the Nashville sit-ins, which occurred from February to May 1960. His first one was at the Woolworth’s lunch counter, where students would spend the day waiting for service that never came and being arrested. Lewis and his fellows were subject to demeaning epithets, had all manner of things poured on them, and were burned by cigarettes. Yet, Lewis reports, “I held my head up. I felt so free. I felt that I had crossed over.” And, indeed, when the trial of the students was at hand and 4,000 protestors showed up at City Hall, Mayor Ben West conceded that the lunch counters should be desegregated. As Norton indicates, Lewis served the movement, for the most part, through action rather than oratory. However, at the March on Washington in August 1963 — with a nation transfixed and an expected crowd of some 250,000 — words mattered. When the lights came up following the film, a visibly energized Lewis took questions from the audience. He was asked about ensuring other rights — for women and members of the LGBT community. His last question came from a small child asking about American immigration policy.